I shared this simple craft on Mom It Forward earlier this week. So quick and easy to create! (And fairly disposable too!) 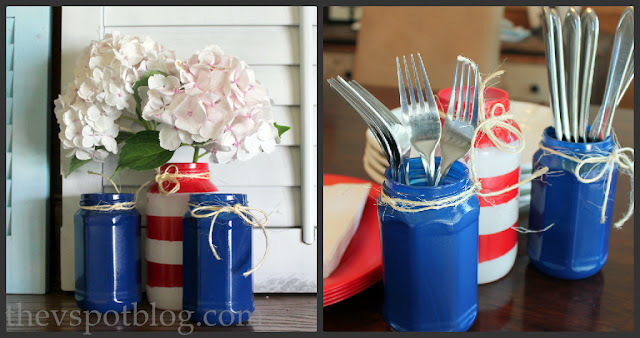 Add some patriotic flair to your decor by upcycling a few glass jars with some red, white and blue. Everyone has glass jars around the house. Create some patriotic vases, or how about just a cute way to set out silverware for your summer BBQ? Tip: start your paint projects upside down, that way you’re sure to get all of the tricky nooks andcrannies. 2. Spray the outside of a jar with the white paint. 3. Spray the other jars with the blue paint. Let the jars dry completely. 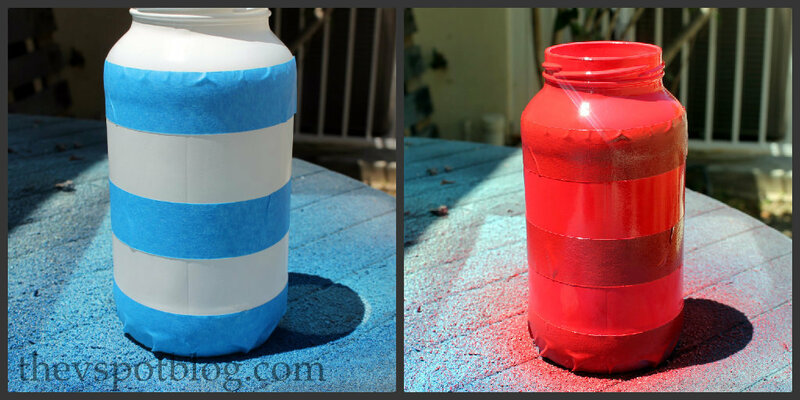 Take painter’s tape and create “stripes” on your white jar. It doesn’t need to be perfect. (It’s an upcycled jar… so it’s already kind of rustic and quirky. Go with it.) Spray red paint over the jar. Remove the tape when dry. Add some twine or ribbon, then decide how you want to use the jars. Cute! Love this idea…now to finish off all the pickles and start painting!